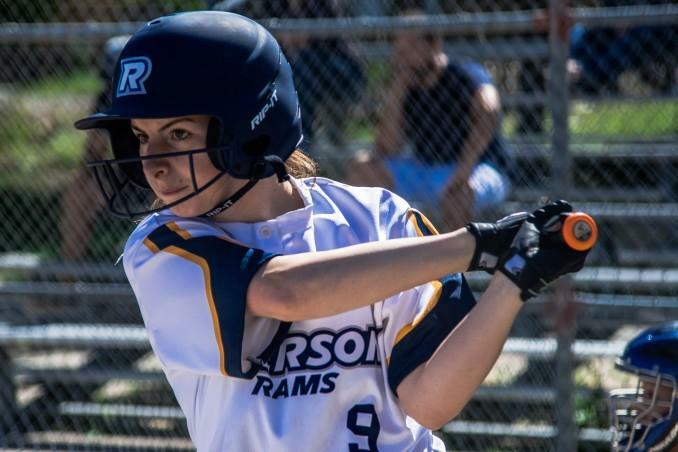 Ryerson’s women’s fastpitch team secured the first two wins in team history on Sunday afternoon, sweeping York with 5-2 and 8-4 victories at Hendon Park. The Rams put game one of the series out of reach with four runs in the second inning. Taylar Oats doubled to second base to score Megan Carroll and Melissa Paglia after Carroll singled to bring home Samantha Hild. Azra Jessa batted Oats in from third with a single five batters later. Ryerson tied the game 1-1 in the first inning on an Oats run batted in by Kaylyn Shaughnessy after York’s Katie Lehoux had grounded out to score Julia Bicknell from third. In the second game, Ryerson rallied from a 4-2 deficit in the bottom of the sixth inning when Jessa’s single and a throwing error by York’s Sara Tumpane allowed Carly Forrester and Hayley Graham to score. Carroll hit a single to score Jessa and put the Rams up for good. Ryerson added three insurance runs in the seventh, off a one-run Shaughnessy single and a two-run single from Hild. UP NEXT: The Rams take on Carleton in a double-header on Friday, September 17 at 7 p.m. and 9 p.m. at Irving Paisley Park.